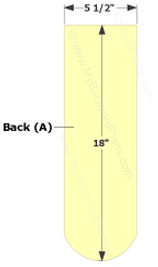 The back (A) measures 18" x 5 1/2", with a 12° bevel cut on the top edge. 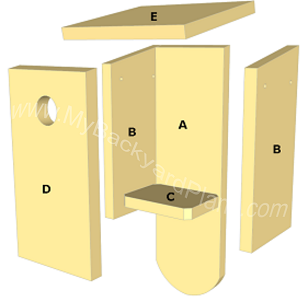 The bottom can be rounded or it can be left squared. 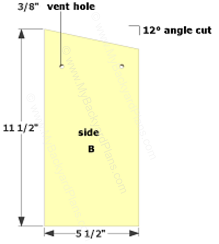 The sides (B) measures 11 1/2" x 5 1/2", with a 12° angle cut. Drill 3/8" vent holes 1" from the top front and 1" from the sides. 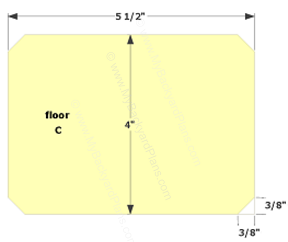 The floor (C) measures 4" x 5 1/2", cut 3/8" from the floor corners. 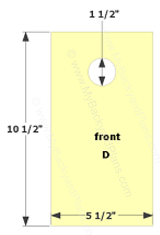 The front (D) measures 10 1/2" x 5 1/2", with a 12° bevel cut on the top edge. Cut a 1 1/2" entrance hole 2" from the top, centered. 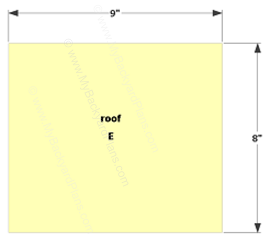 The roof (E) measures 9" x 8" The 9" will face the front, 8" towards sides. 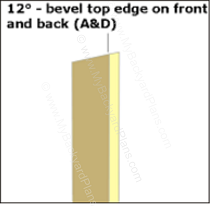 The front (D) and back (A) will have a 12° bevel cut. 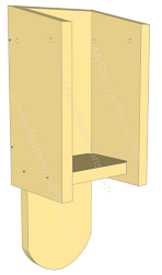 Nail the sides (B) to the back(A) Next, recess the floor (C) 1/2" from the sides and nail. On the inside of the door carve some shallow groves using a handsaw. 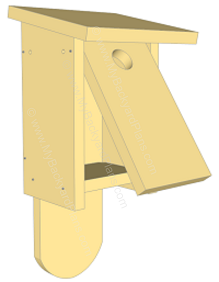 Align the front (D) with the top of the sides (B). 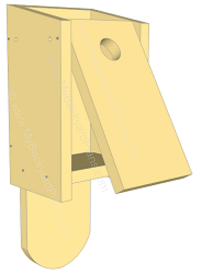 Measure 1" from the top of the side and nail a finish nail through the sides and into the front, allowing it to swing open for cleaning. Center the roof (E) and nail. 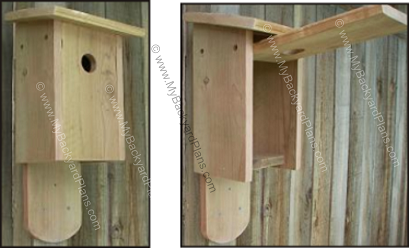 The front and sides will have overhangs. The 9" will face the front, 8" will go towards the sides.